Through the Looking-Glass, and What Alice Found There (1871) is a novel by Lewis Carroll, the sequel to Alice's Adventures in Wonderland (1865). Set six months later than the earlier book, Alice again enters a fantastical world, this time by climbing through a mirror into the world that she can see beyond it. Alice finds a book written in a seemingly unintelligible language. Realizing that she is traveling through an inverted world, she recognizes that the verses on the pages are written in mirror-writing. She holds a mirror to one of the poems and reads the reflected verse of Jabberwocky. 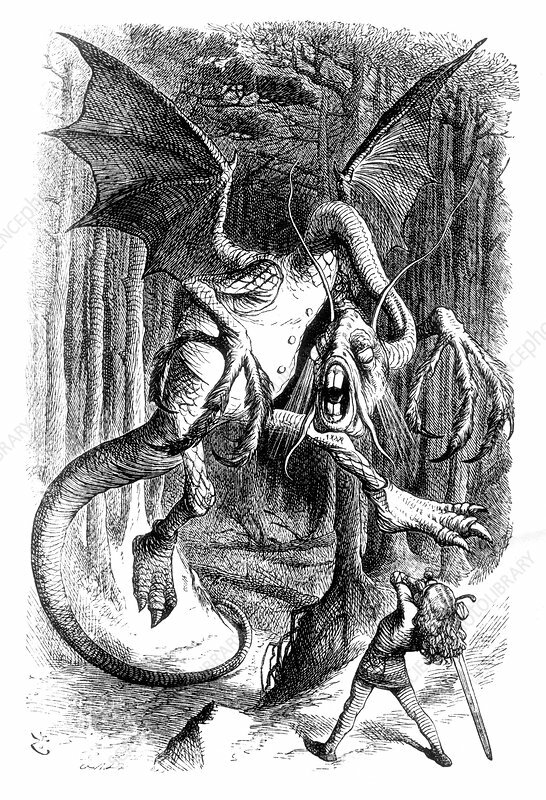 Alice battle and kills the Jabberwock. John Tenniel (February 28, 1820, February 25, 1914) was an English illustrator, graphic humourist, and political cartoonist prominent in the second half of the 19th century.